If you haven’t started your Christmas shopping yet, it’s time to get it wrapped up! If you’re in need of some gift ideas or a little shopping inspo, read on for my Holiday Gift Guide. 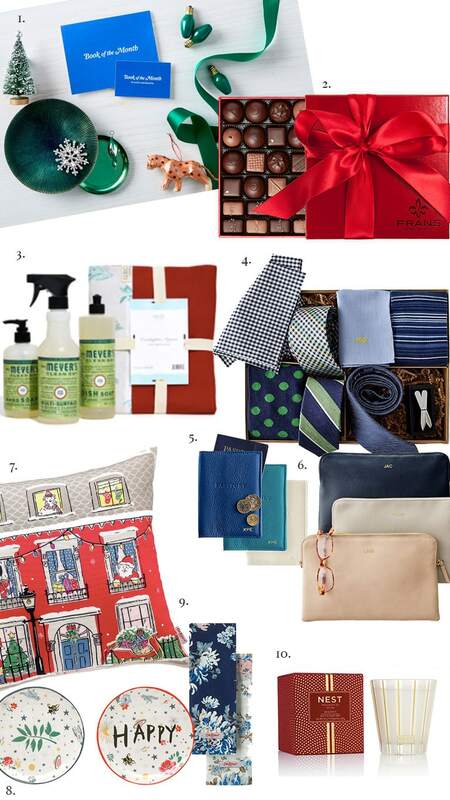 From monogrammed totes, holiday scents and Christmas cleaning – my gift list is overflowing! 1. For the reader, a subscription to Book of the Month is the perfect choice. / 2. Sweet tooth? Luxe chocolates! (I love these delicious chocolates from Frans, a local chocolate boutique). / 3. Grove Collaborative is the perfect source for environmentally-friendly beauty & cleaning products. / Mark & Graham is a favorite for luxury, personalized shopping – the gift for the lover of all things monogram: 4. Tie Bar Gift Set 5. Leather Passport Case 6. Leather Zip Pouch / I love Cath Kidston and her cheery prints! 7. Christmas Townhouse Pillow 8. Fearne Set of 2 Plates 9. Tea Towel Set – in the York Flowers Print 🙂 / 10. Christmas scents for the home with Nest Fragrances and their Holiday Classic Candle.